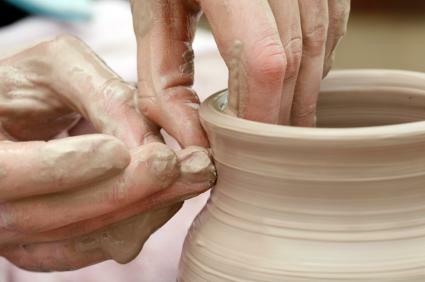 Learning how to make homemade clay can be a great way for you to create many different projects for your home or to give as gifts to family and friends. Homemade clay is frugal, easy to make, and not all at all difficult to work with. Many people wonder what the difference is between recipes for how to make homemade clay and recipes for making dough. Although the terms are sometimes used interchangeably, clay is usually a product that dries hard and can be painted. It is used to make items you want to keep, such as handmade beads or ornaments for your Christmas tree. In comparison, dough is what children use for making temporary projects. Some dough recipes are even made with cinnamon, peanut butter, and other edible ingredients to make them safe for very small children. If you are looking for dough recipes, please review the LoveToKnow Crafts article Recipes for Silly Putty and Play Dough. You may also want to review the Salt Dough Creations tutorial to learn how to make dough that can be microwaved if you decide to preserve your creations. This is a simple recipe that can be made using ingredients you probably already have in your kitchen. Boil the mixture until the texture resembles a softball. Knead on wax paper, then create your item. Play leftover clay in an airtight container. Wrap a wet rag around it to keep the clay from drying out. Allow your item to air dry. You can also bake it in an oven at 200 degrees if you need to speed up the process. Paint if desired, or seal with a coat of clear shellac. Clay made from sawdust dries to be very hard. Mix two parts sawdust with one part water. The mixture should be stiff, but workable. Add water a few tablespoons at a time if you think the clay is too crumbly. Knead your clay until it reaches an elastic consistency. Model as desired, then allow to air dry completely. Sand the clay for a smooth surface. Paint or seal with a coat of clear shellac. Bread clay is fairly easy to make, but it is better suited for making beads or small sculptures than for use in larger projects. Cut crust from bread and add to a mixing bowl. Pour glue, then water onto center of bread. Knead until your homemade clay is no longer sticky. Divide the clay into several parts, and add a few drops of food coloring to tint each clay ball to the desired color. Knead until blended. Allow the clay to air dry, and then coat your creation with clear nail polish or shellac.